Solar panel efficiency is the measure of the amount of solar energy which falls on a panels top surface and is converted into electricity. Due to the many advances in solar cell technology over the last 5 years average panel conversion efficiency has increased from 15% to almost 20% resulting is the rated power output of standard size panels increasing from 230-260W up to 310-330W. Solar panel efficiency is determined by two main factors, the cell efficiency based on the silicon type and the total panel efficiency based on the design and construction of the panel. The cell efficiency is determined by the silicon cell structure and base silicon material used which generally either P-type or N-type. Cell efficiency is calculated by what is known as the fill factor (FF) which is the optimum conversion efficiency of the cell at a temperature of 25 degC. The panel efficiency is determined by the total panel size, cell layout and panel design. This is based on the number and type of cells used, the busbar design and interconnection of the cells. Learn more about the different panel and cell types in the solar cell technology review. Left P-type mono 5 busbar cell from Trina Honey M plus - Right N-type 12 busbar cell from LG Neon 2. The term efficiency is thrown around a lot but a slightly more efficient panel does not always equate to a better quality panel. 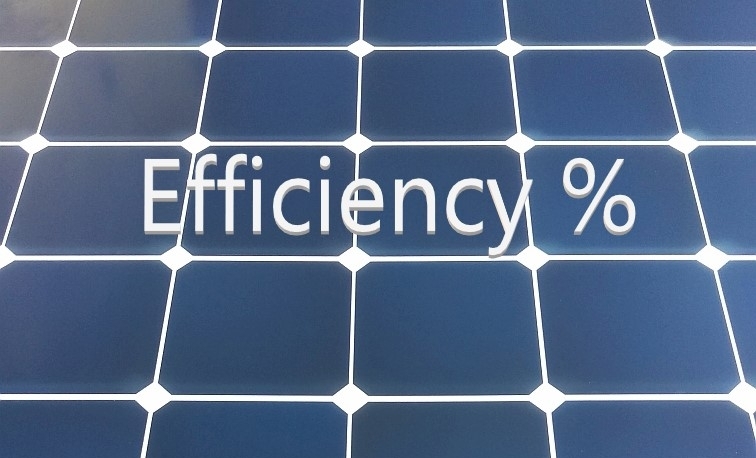 Many people consider efficiency to be the most important criteria when selecting a solar panel but what matters more is the manufacturing quality which is related to real world performance, reliability, company history and warranty conditions. Read more about selecting the best quality solar panels here. Solar panel efficiency generally does give a good indication of the long term performance especially as many of the high efficiency panels use very high grade cells which have improved temperature performance and the lowest degradation over time with 88% or more retained power output even after 25 years of use. Efficiency does make a big difference is in the amount of roof area required. Higher efficiency panels require less area which is perfect where roof space is limited and can also allow larger capacity systems to be fitted to any roof. For example 12 x high efficiency 360W solar panels such as those from LG or Sunpower with a 21% conversion efficiency will provide up to 1100W more total solar capacity than the same number of lower efficiency 270W panels. In real world use solar panel efficiency is also dependent on a number of external factors including panel orientation, location, time of year, shading, dirt and cell temperature. A standard size 60 cell (1m x 1.6m) panel with 17-19% efficiency typically has a power rating of 290-310 Watts where as a panel with higher efficiency of the same size can produce up to 330W. The most efficient panels explained in more detail below use extremely efficient N-type IBC or Interdigitated Back Contact cells which can achieve up to 22% efficiency and generate an impressive 370 Watts. The most efficiency solar panels available in 2019 use premium grade N-type IBC cells manufactured by SunPower and LG Energy, however these panels also come at a premium price. Below is a list of the top 12 most efficient and popular panels currently available. Based on standard 60 (120) or 96 cell residential panels available on the Australian market in 2019, models and specifications may vary depending on country. All manufacturers produce a range of panels with different efficiency ratings depending on the silicon type used and whether they incorporate PERC or other cell technologies. Very efficient panels above 20% are generally much more expensive, so if cost is a major limitation it would be better suited to locations with limited mounting space , otherwise you can pay a premium for the same power capacity which could be achieved by using 1 or 2 additional panels. However high efficiency panels using N-type cells are also generally very high quality and more often than not they outperform and outlast lower efficiency panels due to lower degradation rates, so the extra cost is usually well worth it. Example a high efficiency 330W panel could cost around $300 while more common 285W panels typically cost closer to $180. With both made by the same manufacturer, this equates to roughly $0.60 per Watt compared to $0.90 per Watt. Although in the case the leading manufacturers such as LG, Sunpower, Winaico and REC the more expensive panels have higher performance, lower degradation rates and generally come with a longer 'manufacturers' warranty period, so it is often a very wise investment. Panel size is not directly related to efficiency as the larger panels generally use more cells to achieve greater power output. The two most common size panels use either 60 or 72 cells but a few manufacturers produce 96 cell panels using smaller 5” cells. Most Australian residential installations use the standard 60 cells panels while commercial and large scale solar farms use larger 72 cell panels. In North America many residential installations and commercial systems use the 96 cell panels from Sunpower or Panasonic. The new generation half-cut or split cell modules have double the amount of cells at roughly the same size and capacity, so a panel with 60 cells is now doubled to 120, and 72 cells is now 144 half size cells. The half size cell configuration is slightly more efficient as the panel voltage is still roughly the same but the current is split between the to halves.